Toys R Us valid Wednesday, November 6, 2013 – in store only: $45 (was $69.99) Disney 4-in-1 Ride-ons; $10 (was $29.99) Scooby-Doo! Crystal Cove Frighthouse Play Set; $15 (was $29.99) One Direction Singing Dolls; $59 (was $119.99) LEGO Star Wars Palpatine’s Arrest. 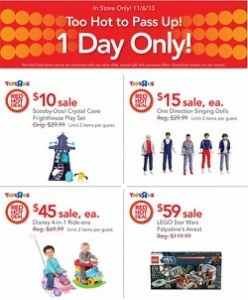 Check all Toys R Us deals on toysrus.com.